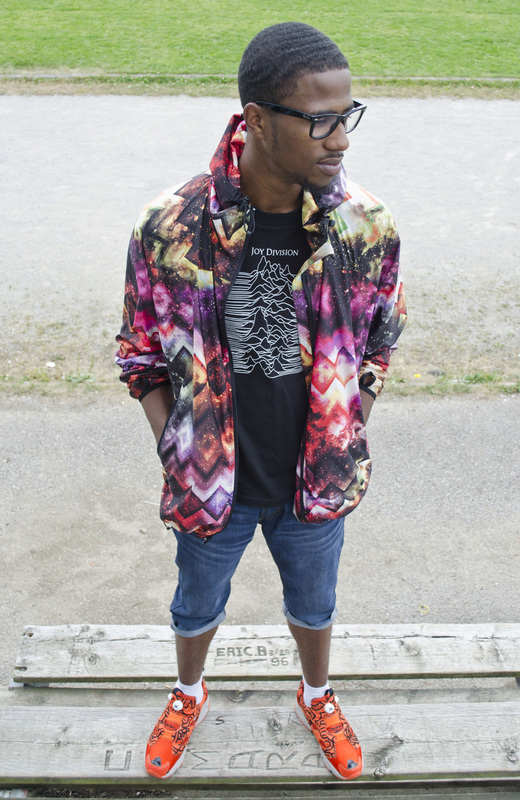 Retrobok is pleased to present its 6th Collectors Feature; this time with a young Canadian with a fresh collection, an equally fresh wardrobe and his own individual approach to life. Tristin has also managed to set the bar high with the photography of his collection. Read on! Please tell us about yourself ; where you’re from, what you do. My name is Tristin Kennedy. I am 23 years old, living on my own, working in hopes of opening a Food Truck one day. I have lived in Toronto, Canada for most of my life. I’m the youngest, only boy of 4 sisters, and just been working, saving and trying to find a better living situation for myself. Thanks for the time and effort with your photos, you’ve raised the bar on Retrobok. I really appreciate that. Your site is well known to the Reebok world. I have to big up my friend Katie Wallace, for really capturing Reebok’s track and field roots in these photos. She really deserves credit as one of Canada’s young and upcoming Black Women & photographers. Absolutely! So, tell us about how you got into Reeboks? I got into Reebok Classics by family more than anything else. I’m born in the early nineties, so growing up the social trend was more towards Nikes, Jordans, the mainstream. My parents didn’t always have the means to keep 5 kids in flashy clothes, so I was used to not fitting in, in that regard.My mother’s fiancee used to come home after 18 hours days in a white tee, dirty blue jeans, and a fresh pair of White Classic Leathers. Not just the regulars, these had an icy blue sole with T.DOT graffitied into the outsole. Well, one thing lead to another, and he hammy downs these pair of CLs to me. And I rocked those so hard, I probably whitened them at least 100 times! They don’t fit me anymore, but it was my mum’s fiancee; his demeanor, his classic look, that inspired me into Reebok Classics. Talk us through your collection. You seem to love collabs! I really do, since designers and collaborators put way more creative effort into what you would hope to believe they love. But first, I have 4 pairs of Classic Leathers. I’ve got a White/Gum leather pair, a really dope Navy leather pair, with Lamb Shear lining (I believe from a Fall/Winter line a few years back), a Khaki suede pair, and a Silver Casual model. I found these at various random outlets, all no higher than $60, which are scores. As I mentioned, I never really had money for mainstream sneakers, and these fit my price range. Its now to the point I value Reebok because they give sometimes 3-4 different uber quality materials, all at prices you can’t beat. Two pairs of Royal Missions, one in Navy/Blue and 3m heel. The brother, a Black/White. I’m also home to a family of GLs (2620’s, Sea Glass 6000’s, and Red suede 6000 mids) which I love. Last but not least, I scored these hella retro Pump Furys; x Keith Haring, and one self made custom I call the Bayside Highs, inspired by my love for 90’s wacky shows like Saved By The Bell, Fresh Prince, Mighty Morphin’ Power Rangers, etc. I love my collection because I feel its one representation of who I am, and when look in my closet, I’m happy. 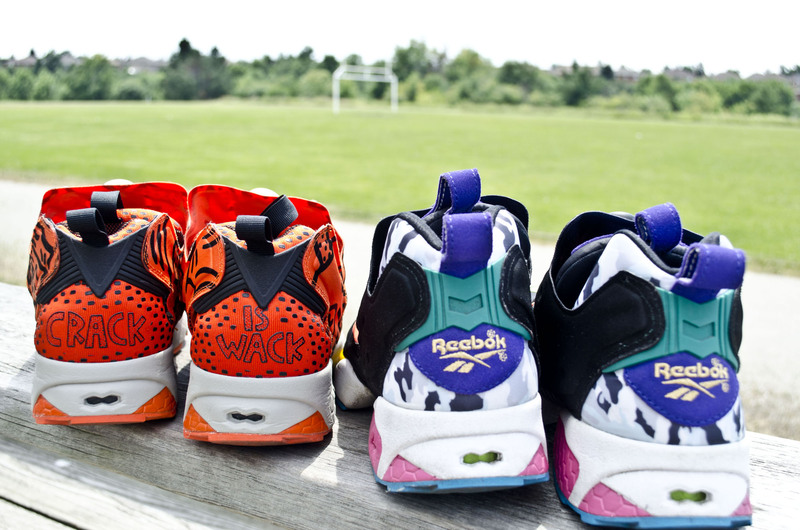 How do you see Reeboks popularity in the Canada and the US at the moment? They’ve certainly been working hard on the retros, as well as the newer models. There are far greater choice anywhere else, but Canada (Toronto, GTA for me) I’ve been to Reebok outlets, but they focus more on fitness/CrossFit, but barely any Classics! It’s upsetting at times. I have to scour, if I can’t find, I have to get online, and as I said, they begin to lose me on the taxes and fees crossing the border. There’s far better variety outside Canada. And tell us about Canadas – or even Torontos’ current kicks scene, less of the b-ball shoes? Well Toronto’s kick scene is predominantly Nikes, LeBrons, J’s, Kobes, etc. Essentially, whatever the man tells us is coming out, is what the masses go crazy for and line up for. Adidas have lately been making a mark again, off the soccer pitch too. I do feel a lot of people still are “trend followers” as apposed to “trend setters”. It’s human nature and a desire to fit in, but I’ve grown to accept and be comfortable in being different. I want it to be all love at the end of the day. Your Reebok collection is essentially runners – have any Basketball shoes ever appealed? Or do you prefer low-cut kicks generally? It’s not that I don’t like Reebok’s Basketball line. I feel its just overshadowed the Classics as a whole (at least in post retro/modern Western culture). I just prefer the down to earth, hippyish look that the cross trainers give me. I like joggers, vintage tees, loud expressive colors, the real 90’s vibe. If Daria Morgendorffer and Urkkel did some DBZ and fused, I’d pop out the smoke lol. Not only visually, but (runners) pack support, cushioning, and are just lighter. I’ve noticed in your photos you wearing a classic Joy Division Tee as well, do you have a particular affinity with UK culture, or is it just coincidence? Too funny. When I first saw this shirt it spoke volumes, visually to me. The band name, the visual concept, how I was feeling that day, it expressed itself to me more than just on a music level. I personally do love the UK culture; ANUVAHOOD, Kid.ulthood. Adulthood, Attack the Block, Shank, I could go on. David Attenborough is my favorite documentary/spokesperson, by far. I see the culture, people like Adam Deacon and say “Yea, forsure we’d click”. Your Pump Furys are very sweet, does it take confidence to wear those super bright Orange Crack is Wack Keith Harings? Or are they just a regular pair of colourful kicks to you heheh? Thanks. I take pride in my Furys. Since I first seen them, I’ve been enthralled with their story ever since. How Steven Smith just wanted something different, cool, radical, not your average. It’s the heritage of the InstaPump that makes me want it, the message the original portrait stood for, with the wildfire the drug Crack was at that time and still is, in respect to the late, great artistry of Keith Karing and the fact I have a matching vintage tee by him, R.I.P. I’m guessing you’re a big fan of the Ventilator? I don’t think anyone who owns more than a single pair can help loving them! Those Extra Butters look delicious! Absolutely a big Vent fan, no pun intended. Another shoe that’s been a sleeper, but slowly making its fame. The ventilation windows, the Hexalite heel and bridge, all pieces that make the shoe whole. I’m really feeling the Kendricks, Burn Rubbers, any color way honestly. The new Adapts look even more lightweight, though I would have preferred more retro logos. Also, I’m feeling the new Hundreds colab, and those all white Supremes, but as I said, any really. Have you worn your (red) GL 6000 mids much? I wanted to love that shoe so much but find it hard to pair mine up with the right clothing. Tips gratefully received! Personally, I’m all over the place, but try contrast clashing, go khaki Levi shorts, grey polo/v neck (keep those white tube socks up high, El Tri$to out here haha) or perhaps navy joggers, vintage crew neck sweater. Good tips, thanks! You have a couple of Royal Missions in there, not a shoe that gets noticed much (even at Retrobok, I’ve still to pick up a pair) – it’s a very tidy looking shoe, I’m presuming they’re a very easy-wearable daily runner like the GL 2620’s? Absolutely, the Royal Mission got slept on hard. The superb fit, especially my suede pair, they are just a dream to walk in. Honestly, they’re probably on par with my 2620’s for most usage. My favorites are my Baysides, Extra Butters, simple. Also, I should mention a true sleeper – one my highschool sweetheart Chanel Blackwood (Kennedy in the future lol) loves on me; my Navy CL’s with Lamb Shear lining. Haha cute 😉 And those CL’s are very tidy. How’s Canada for boutique sneaker stores? My radar is a bit weak living on the opposite side of the planet. Toronto has been making strides, what with their House of Hoops Footlockers, but those cater towards basketball/mainstream shoes. Even there, you might find the Reebok section only with about 4-6 shoes. White CLs, Black CLs, maybe a random GL, and a couple of Vents. Nothing special, nothing to scream about.I’ve had better luck going downtown Toronto, searching the thrift shops. One place, Groovy Shoes @ 323 Queen St. W, has a massive selection of R/Cs, NBs, anything cross trainer related. They even had an OG citron Pump Fury just sitting there. I’d have scooped it, but they’re size 13, so they’ve sat there over 2 years lol. The SVP Premium…Boutiques are also really nice. They’re all white inside, and have everything set up like an art gallery. So, away from Reeboks a bit – tell us about any other kicks you have in your collection, and your feeling towards other brands? Beige and Black pairs of Timberland for winter use, 4 pairs of LeBrons strictly for basketball. If I don’t run with Reeboks, then I’ll rock some Vans (Atwoods, 106 Vulcs, Chukkas) or the Cons (Allstars, AeroJamz). I do have one pair of Jordan 4’s my homie Darnell from highschool gave me. I really want to add more Reeboks though, its all Retroboks now! Haha nice touch! Is there anything you’d like to see more of on Retrobok? Retrobok is a great, informative site. Period. There are just so many sites that explore Reebok Basketball. I personally love the direction the site has, the knowledge that gets bestowed upon it, and the total commitment you put into this site. Some things to add would be more Pump Furys, FuryLites, Vents, and some Reebok Classic fashion. Just to thank you for giving us the opportunity to highlight Canada as a stronghold for young, smart and upcoming black people. Thank you for accepting my collection into your prestigious ranks. I used to feel I was one of only a few true Reebok lovers, but for sure I know I found the right site, hope to see more Reebok Classics in Canada as a whole, let’s start the movement together! Thanks, God bless. Thanks for your time, efforts and awesome photography Tristin. Keep in touch! Posted on August 5, 2015, in Features, Newsfeed and tagged collectors feature, Reebok Classics, Retrobok, retrobok collectors feature. Bookmark the permalink. 7 Comments. Tristin here. Thanks so much, our team loved the opportunity. Triston, you have raise the bar to a higher level, this achievement of yours has only began to generate inspiration to a community of youth who may see that there dream can still be a reality. BIG UP! bro. Triston, you’ve raise the level of inspiration for the black community this passion that has been integrated within you from earlier days has now been seen by the world. BIG UP! Great job Tristin, I am very proud of you.